The sun is at last shining. Most of the undergraduates have dispersed leaving the library and atrium feeling strangely empty and rather lonely. However, the campus is far from quiet. Major building work is underway; buildings are cordoned off, the chapel stands gutted and open to the elements, and the sound of heavy plant machinery fills the hot summer air. All this tells us that the spring/summer semester has now drawn to a close and this affords me a brief respite in time to give you a round up of news about the centre for the year so far – and a very busy year it has been! A recent post on the Classics for Everyone blog might be of interest to a number of readers, particularly those who recently attended the Summer Greek school here at Newman. At the beginning of the week we spent some time discussing the problems that are posed concerning how to pronounce words of a language that is no longer in use. This problem is exacerbated by differences in conventions relating to pronunciation of Classic and Koine Greek, different institutional and national preferences, as well as a school of thought that is seeking to adopt modern Greek forms. We also looked at a few ways that do help us to approximate (at least) how we think various letter forms and dipthongs were sounded; sound effects in plays (notably Aristophanes’ Frogs ), onomatopoeic words, as well as apparent auditory errors in the copying of manuscripts. However, we also noted that the oral aspect of Koine is helpful (I’d argue essential) in not only learning the language and helping words to register in our minds, but it also helps to make sense of some of the language’s idiosyncracies (for example, why some endings differ depending on whether the following word begins with a vowel or consonant). Just sounding it out? Greek and Latin from speech to page | Classics for Everyone. Finding something on the internet that is fun, absorbing AND good for research is always something to be welcomed and widely shared! Here is a chance to work with ancient papyrus documents from Graeco-Roman Egypt that have never before been properly examined on a project called Ancient Lives. You could find yourself working on a third century letter, or a sixth century set of accounts, or even a second century biblical text…! The fragments belong to the Oxyrhynchus Papyri Collection which belongs to the Egyptian Exploration Society. It is the largest collection of papyri in the world and is housed at the Sackler Library in Oxford. 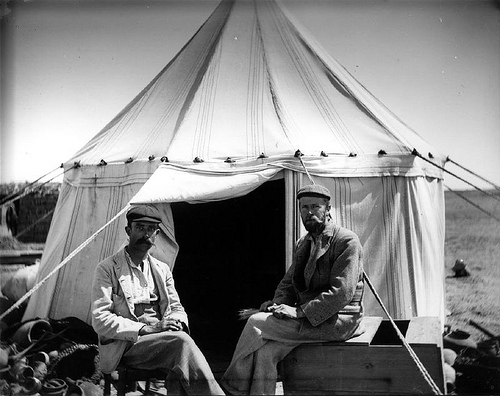 The Egyptian urban centre of Oxyrhnchus (roughly 160 km south west of Cairo) was excavated by Bernard Grenfell and Arthur Hunt between 1886 and 1907. One of the most apparently unpromising places of their excavations turned out to be the most valuable: the town’s rubbish dumps. Because of the lack of rain and arid conditions, they discovered thousands upon thousands of papyrus documents dating from the third century BCE to the seventh century CE. Their contents, mainly written in Greek, provide us with valuable information of day to day life at this time. As well as numerous letters and accounts of daily transactions, the collection also include early Christian writings, biblical texts and classical works. Numbering over 500,00 pieces, means that there are still many fragments that have yet to be properly examined. One of the major tasks is their transcription. Transcription is the process where the writing on the papyrus is retyped using a formalised alphabet making the text a lot clearer to read. 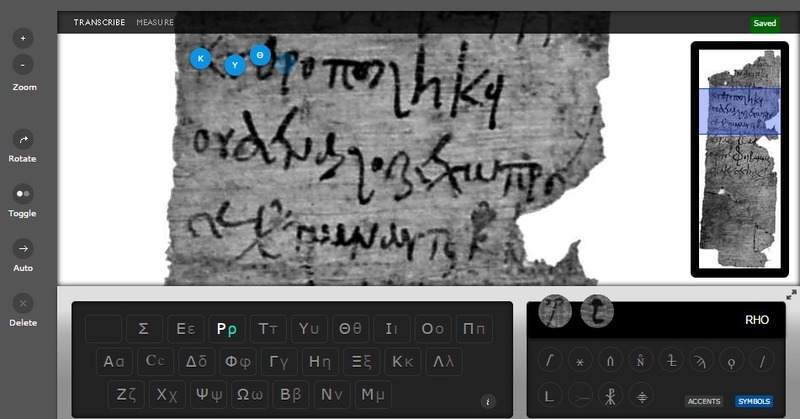 The innovative Citizen Science platform Zooniverse, together with the University of Oxford, have provided a way for every one to be involved in transcribing ancient papyri without having to have any specialist knowledge – and you do NOT have to be able to read Ancient Greek (although familiarity with the alphabet would be a help). Together they have set up a transcription workspace on their Ancient Lives project. Images of the fragments can be viewed on a screen with facilities to rotate and zoom. There is also the capability to record and measure each fragment. 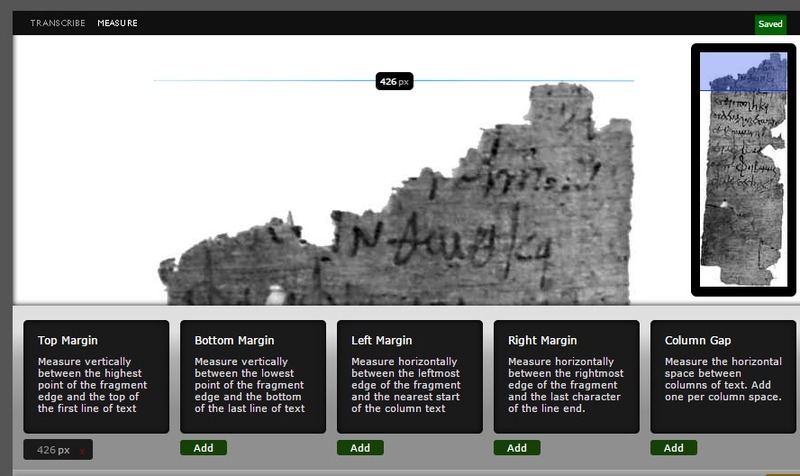 There is a short tutorial explaining the functions of the workspace tools after which you will be presented with an image of a papyrus fragment and you can get straight to work! The transcription process is easy. Clicking on a letter on the fragment places a coloured spot over it, you can then decide which letter or symbol it matches most closely to on your keyboard that is positioned just below the screen. In this case kappa, upsilon and theta have already been transcribed. The next letter is highlighted with a blue dot and the cursor (not seen in the screenshot) is over the letter ‘rho’ and highlighting it. The ‘map’ in the inset screen on the right indicates where you are in relation to the complete fragment. Alongside transcription, each fragment requires measuring. This is done by clicking on the ‘MEASURE’ tab. Another valuable feature is the Talk facility that allows you to write comments, questions and join in discussions about the particular image on which you are working. 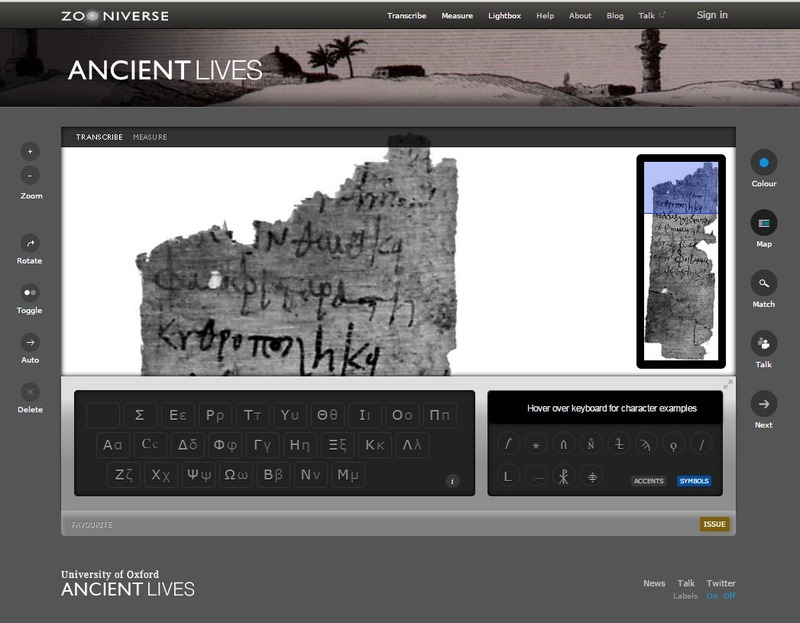 Once you have finished transcribing and measuring the fragment, you can review your work by using the ‘Light Box’. This displays all the fragments on which you have worked. Information about each fragment (how many times it has been transcribed, measured and any discussion about it) is revealed by clicking on the image. This is a wonderful opportunity for those who would like to get involved in working with ancient manuscripts. Although this work can be done without any knowledge of ancient Greek, a familiarity with its alphabet (remember only majuscule – approximating to the Western upper case) was used at this time. It is absolutely ideal for those who attended the Summer Greek course in August and want a fun way to avoid getting rusty! Additionally there is a very helpful blog administered by the ‘Ancient Lives’ team and regular twitter updates – @ancientlives. Welcome to the Centre’s website and blog! 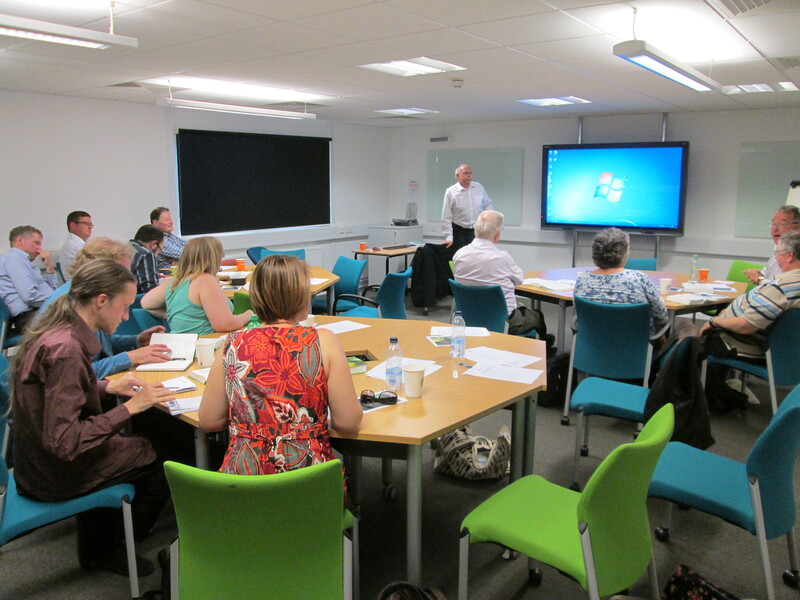 Following our Spring seminar series Looking at Mark’s Gospel through First Century Eyes, we had a very busy summer. On one of the hottest days of the year we held our first conference. 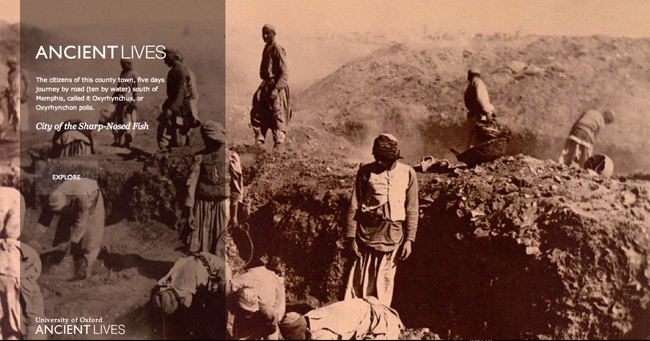 Voices from the Desert explored the journey of the Bible from dissent to orthodoxy and then back to dissent. We were very privileged to have Dr Lloyd Pietersen with us as our key note speaker. In the morning he read a paper outlining his reading of the Bible from a Post-Christendom context. It was a fascinating and challenging session helping us to see how differing contexts can influence the way we read a text, particularly when relating to position of power and influence. Lloyd followed this with an equally fascinating workshop where we were challenged to read some of the parables of Jesus from a minority (or dissenting) perspective. You can read more about Lloyd’s work in this area in his book Reading the Bible After Christendom published by Paternoster (2011). Dr Susan Docherty and David McLoughlin also presented fascinating papers that helped provide an historical context for our later discussions. Sue’s paper on the use of the Old Testament in the New Testament gave us a fresh insight into the creative re-appropriation of texts by different groups as well as providing a more nuanced understanding of the continuity of Jewish thought and scriptural use within the New Testament writings. This was followed by an inspiring paper given by David that vividly painted the historical landscape in which the New Testament text was formed and highlighting, in particular, the political and economic environment of these times. We were also delighted to have with us Symon Hill from Ekklesia with us. He ran an extremely thought provoking afternoon workshop looking at the Gospel of Mark from the perspective of a political activist often showing, not just a political dimension to a story or an account, but how politics can influence our understanding and reading of a text (as well as how a text may inform a person’s politics!). Professor Martin O’Kane led a wonderful afternoon workshop using images of the paintings from the nearby Barber Institute of Fine Arts to explore painting as biblical interpretation. In many ways Martin’s workshop brought together all the individual elements from the rest of the day and highlighting the power of certain biblical images and motifs and their ability to be reinterpreted in a fluid process of appropriation and re-appropriation. This was the first of our summer Greek schools and ran for three (fairly intense!) days. Noting so many people’s reservations about learning ancient Greek, the accent of the course was informality and fun in order to build confidence with the alphabet and language of the New Testament. 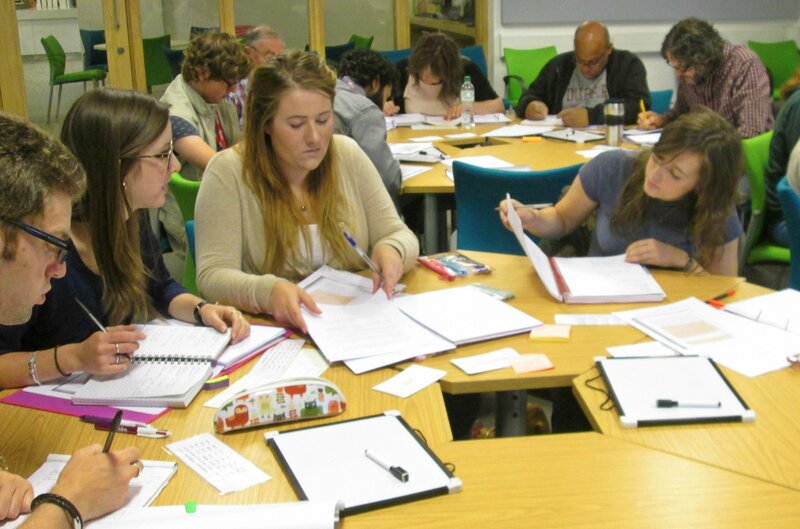 Throughout the course we worked closely with the Greek New Testament and by the end of the three days those attending were able to be able to read simple sentences and clauses from it. The scribe and manuscript in the life of the New Testament. “Are we sure it originally said that?” On which Greek text are our English New Testaments based? How to enhance your textual study by using open-access, online Bible study tools (a tremendous resource for Bible study and commentary writing!). 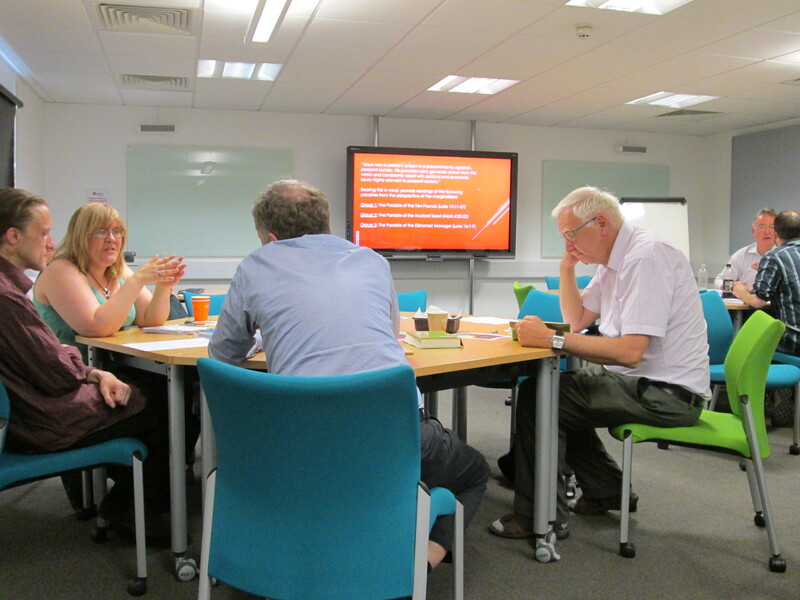 ‘How would you?’ problem sessions – YOU take the hot-seat and decide the best way to translate a problematic text. 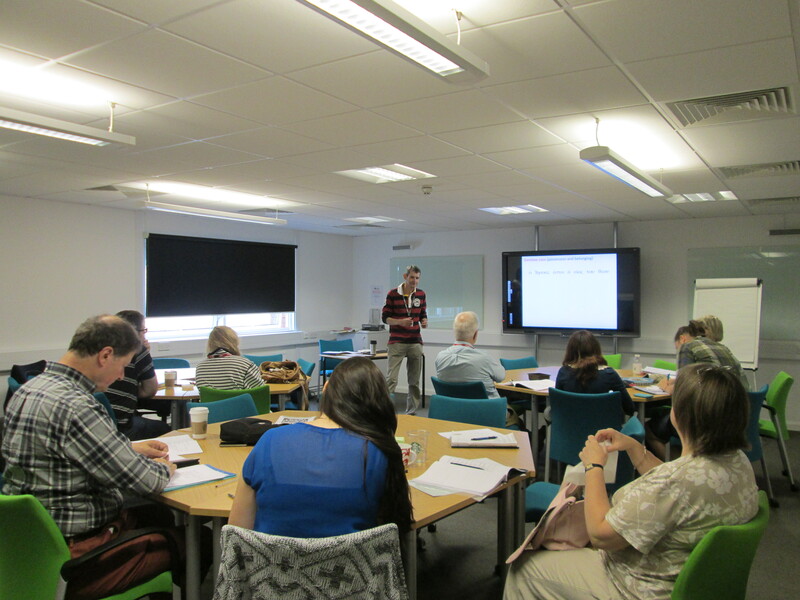 Those attending the course came from a wide background including current students, post-graduates, those studying or with an interest in theology as well as a number of historians. Most of the time was spent working in small groups with set material, exercises and games. Working like this helped to create a more cooperative learning environment. As I taught the course, I am probably not the best person to comment on its success, suffice to say I enjoyed it enormously and was really impressed with the ability and progress (not to mention unflagging good humour) of all those attending! We plan to hold similar events next year – we will keep you posted!